One of the first Christmas tasks that pops up on the calendar is sending out the Christmas cards, and it's a good idea to start thinking about them sooner rather than later. 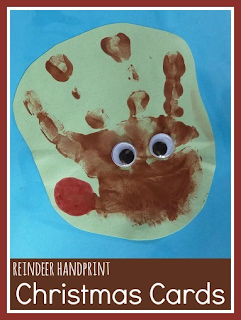 With young children, I like to involve them in the making of the cards, and they can easily make these lovely reindeer cards using their hand prints. 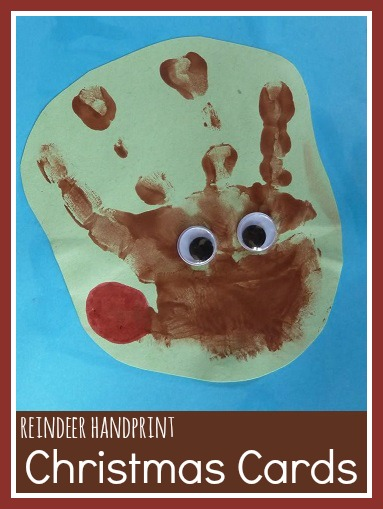 I must admit that this handprint reindeer Christmas card is not an original idea. Harry brought one back from nursery last year and I fell in love with it, so much so that I kept in my drawer all year long to use as a bookmark. This year I decided to replicate it using Mia's hand for the reindeer and Harry's help to add the details. All you need to do is make some handprints with brown paint onto coloured paper or card. It's worth making far more than you need so that you can choose the best in case any end up smudged. Then just add two googly eyes and a red nose! If you are hand delivering the cards you could use a red pom pom, stuck on firmly. I cut out the reindeer faces and Harry then helped me to glue them onto some contrasting coloured card, this way you don't need to worry too much if you end up with some mess around the edges of your prints. We used different sized googly eyes for some variety. They are so easy, and I think they look really sweet! This Christmas card post was part of the Counting Down to Christmas Blog Hop, co-hosted by the following blogs: Rainy Day Mum ~ Making Boys Men ~ Here come the girls ~ TheBoyandMe ~ Life at the Zoo ~ Jennifer's Little World ~ Playful Learners ~Mummy..Mummy.MUM!! We made loads of different versions along this theme a couple of weekends ago. Our school PTFA organises the kids pictures to be turned into professional looking christmas cards, so we had to come up with a design. We did foot reindeer faces with handprint antlers, foot print chrismas trees (heels together, toes apart pointing down the page) and finally hand print christmas trees, which was the design we finally went with. I can't wait to see the finished product. Those are lovely, I may borrow it for our toddler group Christmas cards. 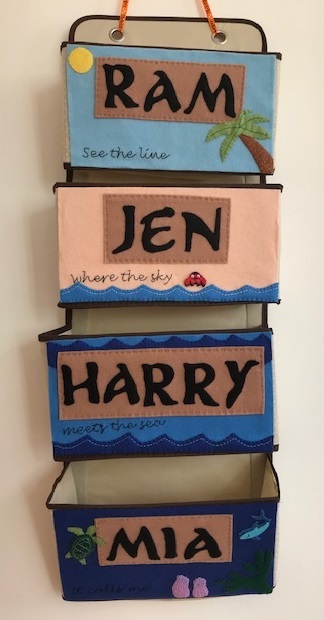 These are great, I keep thinking I must do something like this with Alex, but with no wipe-able floors I am always dubious about getting the paints out! I have seen some good fingerprint ones too, so maybe I can try that instead. Oh I love how simple it is! I'm pinning it! Thank you everybody, I'm glad that you liked them! If doing handprints with a baby I recommend covering the table, putting on a long-sleeved apron, holding the hand tightly while you do the prints then immediate removal to a sink! These are such fun! I adore them.